What can you expect when you arrive? Friendly people who enjoy singing! information. We do not share your email address with anyone else! playing the piano as people filter into the seating area. We started by inviting only people who have mild to moderate cognitive impairment such as dementia, Alzheimer’s, or brain injuries. We expanded our invitation to include those living with Parkinson’s Disease, with those who cannot drive on their own accompanied by a care-partner. The health benefits of singing are so varied, and apply to so many health issues, that we now invited EVERYONE to join in Side by Side Singing. Anyone interested in community singing is welcome! Each session will begin with musical ice-breakers and vocal warm-ups, followed by singing of rounds and well-known songs. Though not designed to be a performance choir, simple harmonies will be taught, and those with a knack for singing harmonies will be encouraged to do so. Songs will be chosen to promote feelings of joy and well-being. Opportunities will also be provided in each session for participants to sing solos, play rhythm instruments and get up and move a little, too! Piano accompaniment will be provided. 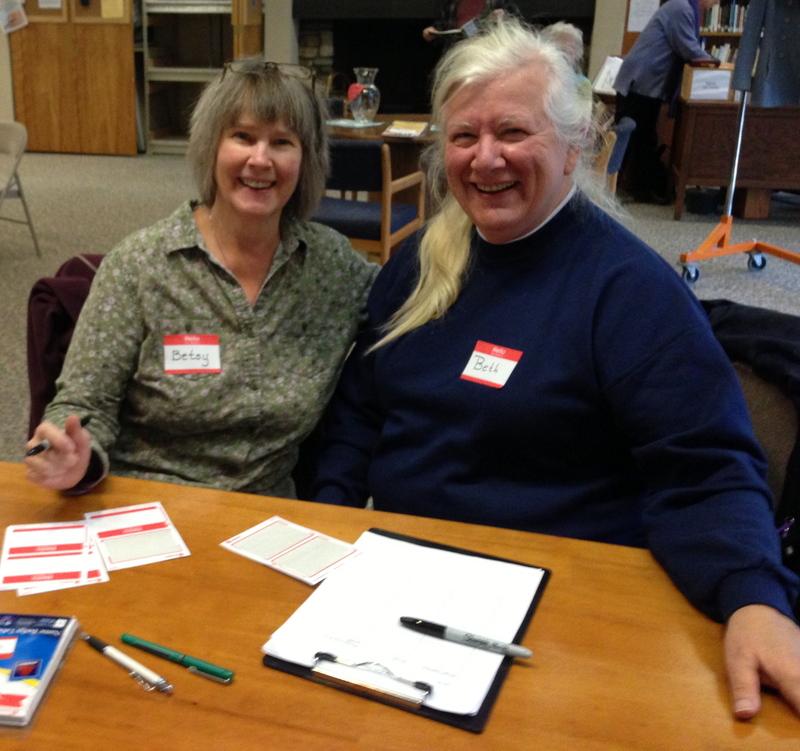 Each session will end with 15 – 20 minutes of socialization with refreshments provided. 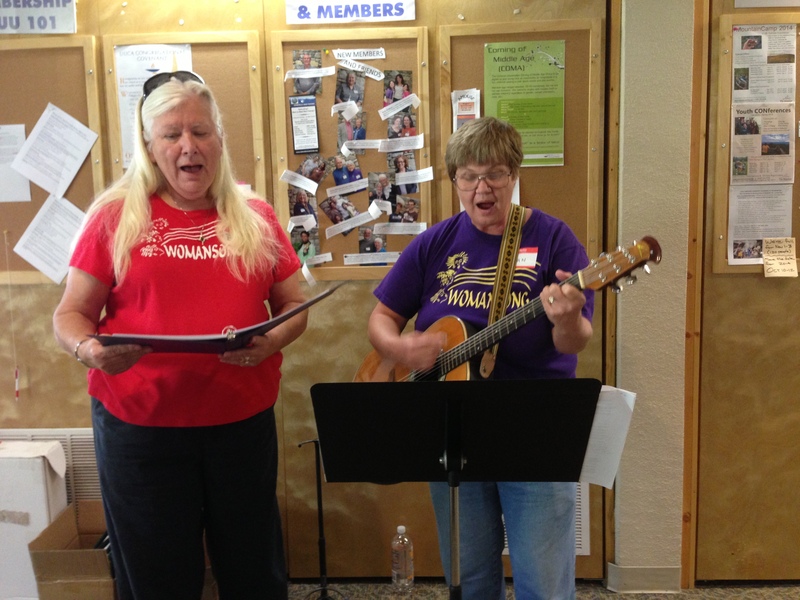 Singing together enhances quality of life on many levels. This positive initiative is also a part of an effort to reduce the stigma associated with dementia, Alzheimer’s disease, cognitive impairment, and Parkinson’s through the communal experience of creating something beautiful in the present moment. You might be wondering if you will know any of the songs we’ll be singing. 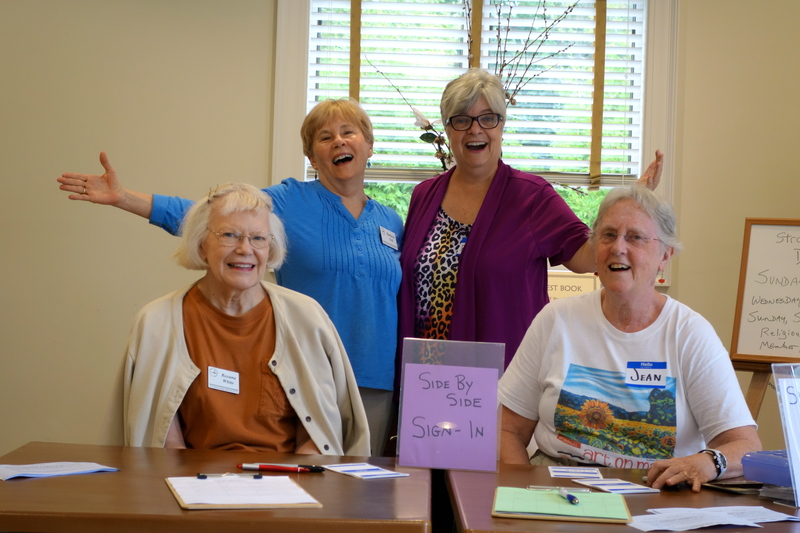 The sign-in desk at Side by Side Singing in Hendersonville. From left: Roxana White, Barbara Eck, Ruthie Rosauer, Jean Tuech. There is no charge to participate in these sessions. We appreciate support from the N.C. Center for Health & Wellness at the University of North Carolina Asheville. changes to parking, location or weather conditions.